I thought that I would post on my routine and what products I’m using. I started using the baking soda mixture with the rosemary EO while I my hair was loose to help with my dandruff and itchy scalp. Commercial shampoos and conditioners I guess were leaving a film or something behind on my scalp because I had itchy, flaky scalp even in the summer. Co-washing was not helping either. Winter time was worse, enough to make my own ski slope. lol The baking soda mixture was helping a bit but I was only at that time shampooing every 2-4 weeks so I decided to try the tea tree oil in addtion to the rosemary oil. The sage oil & eucalyptus oils and Dr Bronner’s are recent additons at month 5. I put those in for growth, addtional scalp anticeptic properties and cleaning respectively. I wash weekly though sometimes it’s been 10-12 days between washings lately since it is winter and I keep my heat at no more than 69 degrees. Sometimes it gets a bit chilly walking around with a wet head. I’ve found that air drying helps to retain moisture. Gotta tell y’all my scalp feels a whole lot betta. I decided to try the jojoba & almond oils for 1) I already had them, hate to waste stuff I’ve spent my hard earned money on and did not work at the time I purchased them, 2) My hair was looking a bit dry after a wash. Now I just tried this on the last wash on Friday and I like the results. My hair dried with a lot more sheen than with the addition of the Dr. Bronners and eucalyptus oil in month 5. I’ve also decided to add a few drops of the jojoba oil to my spritz. I’m liking the results of that too. I just have to be careful that it is indeed only a few drops. Too much and as I mentioned b4, the locs will be feeling a bit stiff. Me no like stiff hair! Dealt with that long enough and I ain’t going back. I’m determined to have soft hair/locs even if that means it takes a while to lock. lol Though, I’ve got some that are actually locking, as you saw in the video/pics so that debunks that myth. Love it when a plan comes together and I do something that someone says can’t be done. Maybe that’s my Mars in Aries the 8th house inconjunct Uranus/Pluto in Virgo in the 1st house. Had to throw some astrology in there. The last change that I’ve made is that I’m going to still retighten at 4 weeks starting in the new moon period but I’m only going to retighten the back and sides. The crown and top/front will be done every 8 weeks. These areas are a bit looser/thinner than the back and side areas of my head. They are still growing and this is the area of my head that grows the fastest so I’ll just have to make sure that I pop those locs after shampooing. Speaking of retightening if you are not sure how to do it I have a video of how I retighten my hair. It will be in the video bar. 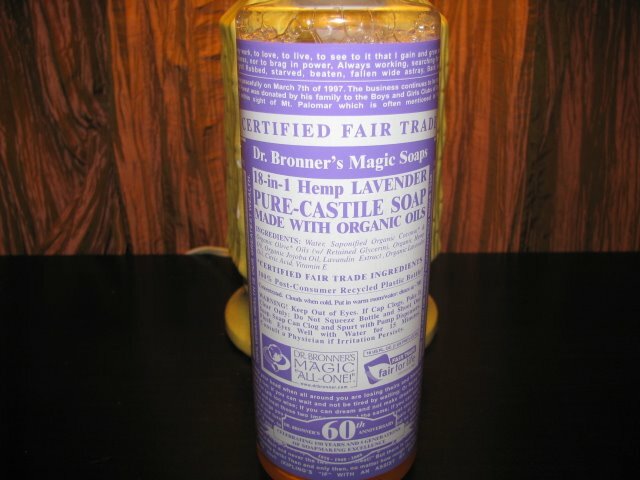 Update: I am no longer using the Dr. Bronner’s as a shampoo just as a body wash. As of October 2009 I’m currently using Raw African Black Soap that I have made into a liquid. There will be a post on this.